Just off the A31 not far from Dorchester in the heart of Dorset lies Langham Estate, the first stop on a vinous tour of some of the UK’s best sparkling wine producers. The brainchild of Justin Langham, this estate is centred around an old Dairy Farm which was planted in 2009 to 11 hectares made up of approximately 40,000 vines. It is the largest single site vineyard in the South West. The vineyards are entirely surrounded by woodland, with a south facing aspect, and the soils are mainly chalk with an abundance of flint found at the top of the slope which rises to around 85m above sea level. The classic Champagne varietals are grown here with 60% Chardonnay and 20% of both Pinot Noir and Pinot Meunier. The first vintage for the Estate was in 2011, and with young winemaker Daniel Ham (from vintage 2015), they are producing exquisite fizz of the highest quality. Daniel believes in low intervention winemaking. By utilising wild yeast ferments for the first fermentation, he has managed to lower the amount of sulphur that is required. 30% of the juice (normally a larger % of which is Chardonnay) is fermented and aged in oak barrels, which are a mixture of 225 and 500 litre capacity and between 3 and 15 years old, the rest going to stainless steel. 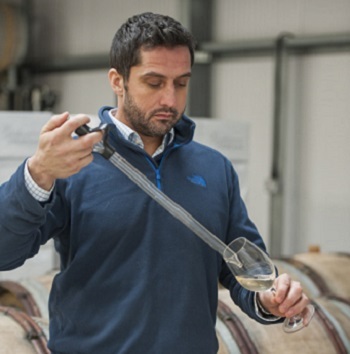 Following the first fermentation the wine is allowed to settle and the oak barrels are then racked prior to the malolactic fermentation which Daniel sees as vital to giving balance to the final wines. The cellar is an old grain store and natural cold stabilisation is achieved by opening all the doors meaning that no filtration is necessary. Ageing can then normally take up to 2 years, but this may change as Daniel doesn’t want too much of the autolytic character (bready/yeasty) so this could end up being nearer to 18 to 24 months, with 12 months under cork as part of that process. Gusbourne has always been a favourite but it has been several years since I last visited and my goodness what changes have taken place. Originally established by retired orthopaedic surgeon Andrew Weeber in Appledore in 2004, not far from Ashford, on the cusp of the Romney Marsh. Today the estate has vineyards in both Kent and Sussex and has established an international following. Gusbourne only produces vintage wines, in fact 300,000 bottles from 93 hectares in total, with vineyards planted with 50% Chardonnay, 40% Pinot Noir and 10% Pinot Meunier. 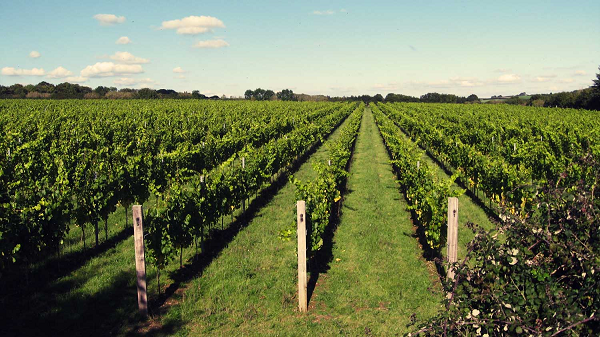 Both the Sussex and Kent vineyards are a similar distance from the sea, but the Kent vines sit at 40m above sea level on soils containing a lot more clay. As a result, they aren’t your traditional ‘Champagne’ soils (i.e chalk) and Gusbourne sets out to tell a different story. Charlie Holland has been the winemaker since 2013 and now combines the role with that of CEO. A hugely talented winemaker, in fact from what he told us about the number of components used in the final wines (up to 120), he’s probably not bad at jigsaws either! The Brut Reserve and Blanc de Blancs can contain 40 different cuvées and are seen as the “Estate voice” with 10% of the wine spending time in oak to give flesh to the mid palate. The barrels are approximately 2-3% new, all French and sourced from 4 to 5 different coopers. They may also contain up to 7% reserve wine for nuance and interest. Over the years the Brut Reserve has seen the percentage of Pinot Noir increase to make it more distinct from the Blanc de Blancs. For the rosé, there is a mix of two methods with a bit of saignée (bleeding of the skins) and then the addition of up to 7% red wine. With the increase in plantings, the cellar has had to grow to accommodate all this extra fruit and has also seen the addition of a gorgeous cellar door and visitor centre, The Nest. It should most definitely be on every wine lovers list of places to visit. Last but by no means least we have Herbert Hall, a delightfully diddy 4.5 hectare estate near Marden in Kent. Planted in 2007 by Nick Hall, the whole ethos here is to make the finest quality, hand crafted, small batch releases possible. The winemaker is Kirsty Smith, a supremely talented lady, who along with Nick oversees most aspects of the estate from vineyard to bottle. From the very beginning (the first vintage was 2009), Herbert Hall has been fully organic, the vineyards are planted entirely with Champagne clones and are split 40% Chardonnay and 30% of both Pinot Noir and Pinot Meunier. The soils are clay with a seam of gravel running through. What makes Herbert Hall unique is its micro-climate, in fact Nick told us that Marden is used as the base for the Kent Air Ambulance as it is so incredibly clement they can always get the helicopter up. At present there are 2 releases on the market; Brut Tradition 2015 which was disgorged in August with 8 grams dosage, and the 2015 Brut Rosé which was made by adding 5% still Pinot Noir at bottling for the second fermentation which also sees 10% barrel ageing. Next year a release of just 1,000 bottles of a 2014 Blanc de Blancs will follow, which I’m sure will express not just the vintage but the quality hallmarks of this boutique property. 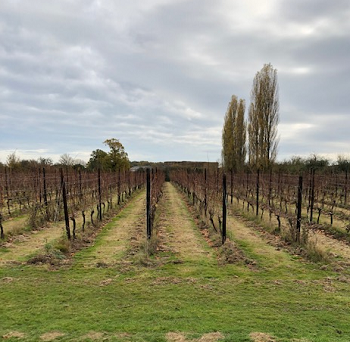 Following excellent growing conditions and reports from around the UK that it’s been the biggest and best harvest to date, English wineries seem to be in a very good place, and we are delighted to be working with them.